No need to enter dates in Excel manually anymore - the Excel Date Picker tool is out. 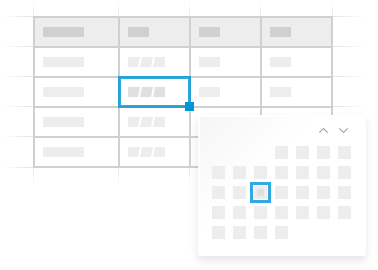 Just run the add-in and get your calendar right in the worksheet. When you pick the date in the calendar, it is automatically inserted into the selected cell. Easily add and subtract years, months, weeks, and days from a date and get the result put into the needed cell. Fill in dates with a mouse click Instead of typing the date manually, click on it in the drop-down calendar. The date will be inserted into a cell automatically. Find out the difference between two dates Select any date in the calendar and see how far out that date is from today's date. Get one-month and two-month views If needed, expand the calendar pane to display two months side by side. Restore the original date easily Accidentally picked a wrong date? No problem, the original date can be restored in a click. Calculate dates Add and subtract years, months, weeks, or days from today's or specific date. Insert the calculation result into a cell Get the result of calculations inserted into the selected cell. 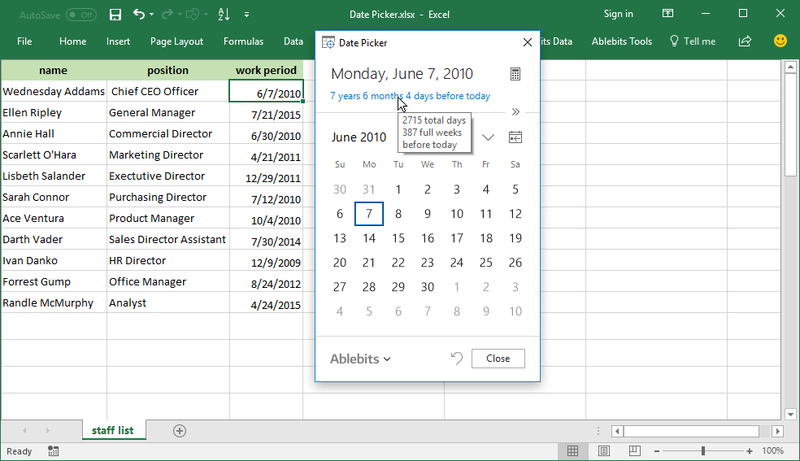 What is Excel Date Picker and what do I need it for? 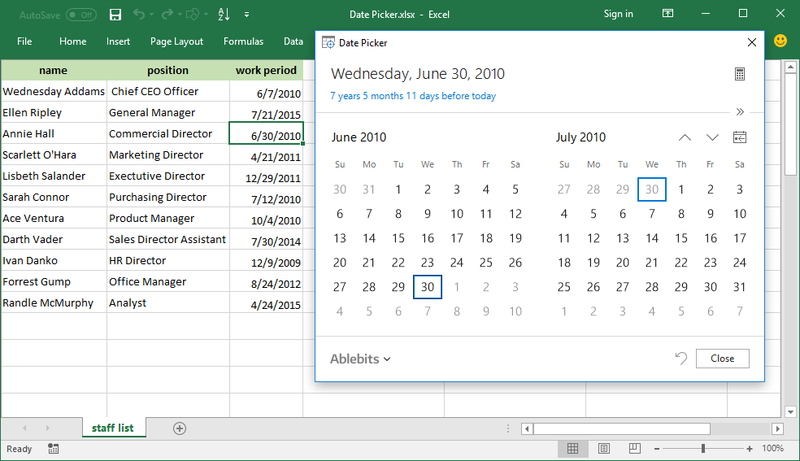 Date Picker is a pop-up calendar that simplifies date entering in Excel. You do not have to type the dates manually anymore, but just run the utility and click on the needed date. The add-in will automatically paste it into the selected cell. How to insert drop-down calendar in Excel? 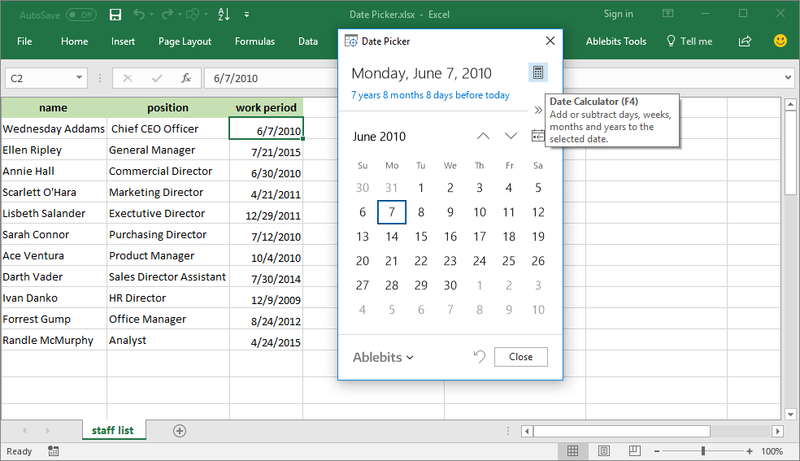 Install Ultimate Suite for Excel and find the Date Picker add-in on the Ablebits Tools pane. Click on the Date Picker icon - the utility is activated. Now you can select a cell, right-click it and see a new option in the drop-down menu - Select date from calendar. If you choose this option, the pop-up calendar will appear. Now you can find the date in the calendar, click on it and get it inserted into the initially chosen cell. Does the week start on Monday or Sunday in the Date Picker calendar? The utility takes settings from the Windows calendar on your computer. If your week there starts on Sunday, it will start with Sunday on the Date Picket pane as well. The same is true about a week starting on Monday. Can I choose any date in the past or in the future? Almost. Due to the Excel's limitations, you won't be able to choose a date before the year 1900 and after 9999. What about the date format? By default, the utility uses the dd/mm/yyyy format. However, if you select a cell and set your format before picking the date, the utility will use the format you've chosen. Can I subtract years or days from the date I choose? Sure! For this use Date Calculator. Select a cell that contains a date value you want to use for calculations. 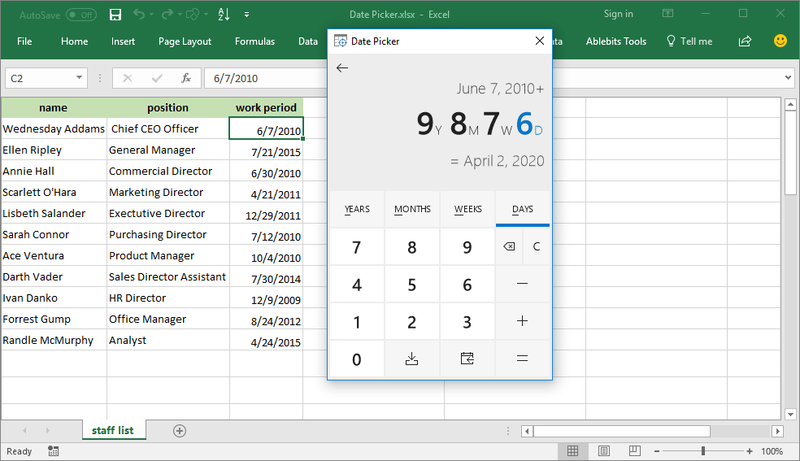 Run Date Picker and click the calculator icon in the upper-right corner of the Date Picker pane. Enter the number of years, months, weeks, or days you want to subtract, and press Enter. The result date will be automatically inserted into the initially selected cell. How to add weeks or months to the current date? Easily. Select any empty cell and start Date Calculator. Enter the number of weeks, months, days, or years you want to add to the current day, and press Enter. The result date will appear in the initially selected cell.